Genus: Hypericum Tourn. ex L.
This species is accepted, and its native range is W. Canada to Mexico. Hypericum formosum var. nortoniae (M.E.Jones) C.L.Hitchc. Hypericum formosum subsp. scouleri (Hook.) C.L.Hitchc. Hypericum formosum var. scouleri (Hook.) J.M.Coult. Flora of North America Editorial Committee (2015). Flora of North America North of Mexico 6: 1-468. Oxford University Press, New York, Oxford. Larson, J., Reif, B., Nelson, B.E. & Hartman, R.L. (2014). Floristic studies in North Central New Mexico, U.S.A. the Sange de Cristo mountains Journal of the Botanical Research Institute of Texas 8: 271-303. Robson, N.K.B. (2002). 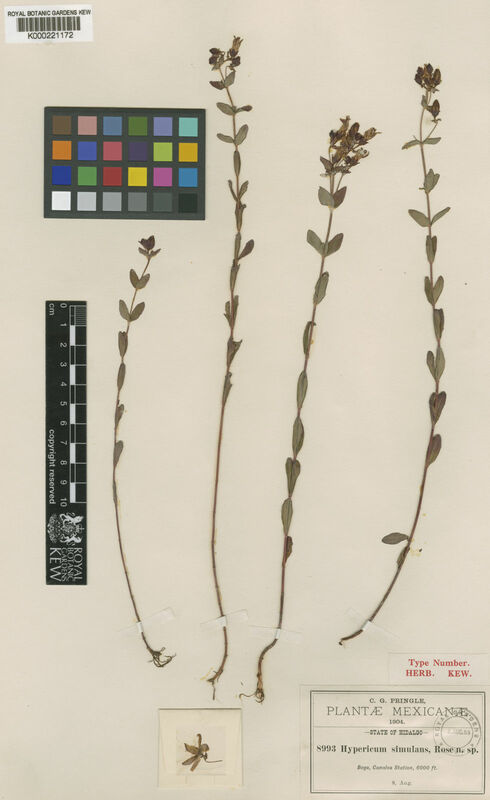 Studies in the genus Hypericum L. (Guttiferae) 4(2). Section 9. Hypericum sensu lato (part 2): subsection 1. Hypericum series 1. Hypericum Bulleton of the Natural History Museum. Botany Series 32: 61-123.